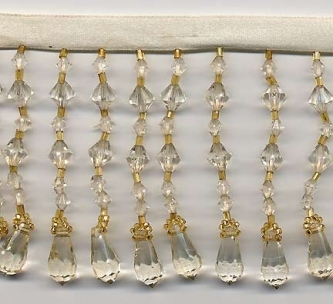 From our Teardrops Collection: A very soft and warm ivory beaded fringe trim that would be equally at home in a contemporary or a traditional room. Exceptional detail and craftsmanship with high quality crystal clear acrylic beads. Each beaded strand is 3" long, including the 3/8" rich beige satin ribbon. Even bottom. Click here for more Images, Samples & Bolt Pricing for this item.